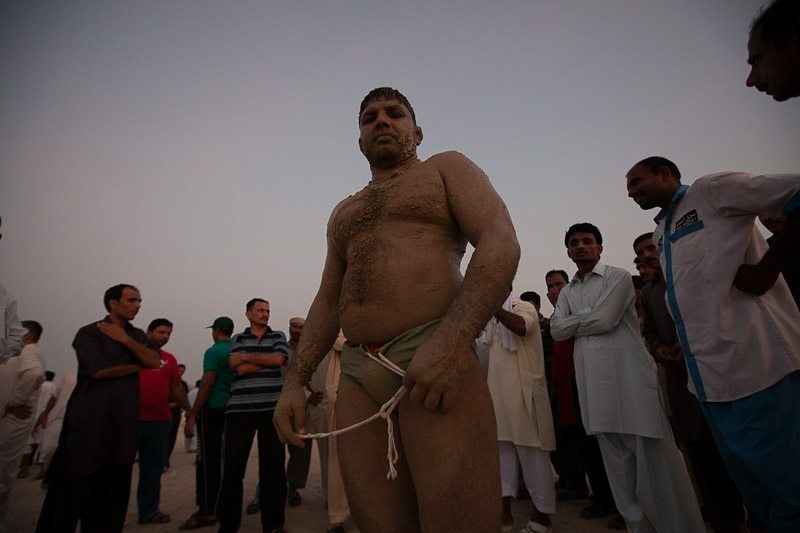 “Just head down to the fish market, then follow the groups of Pakistani men to find your way.” This was the directions to one of Dubai’s less-known Friday attractions: kushti or pehlwani, an age-old form of wrestling that is practiced all across the Indian subcontinent. In Dubai, home to hundreds of thousands of Indian and Pakistani nationals (together they make up more than half the city’s population), the open-air kushti games draw crowds of spectators every week. It’s only just turned September, and the city is still immersed in the summer heat. This Friday, as the time nears 5.30 in the afternoon, there’s a slight breeze from the ocean. Down by the water in Deira — one of Dubai’s oldest neighbourhoods, today distinctly South Asian — the evening life is slowly about to start. And, just like the directions indicated, there’s a large assembly of men wearing Pakistani clothes. They’re all walking in the same direction — towards the large, empty parking lot just in front of the Hyatt. In the middle of the sandy field is a ring of spectators, growing larger as more people join, waiting for the wrestling to start. In the middle of the ring are men with colourful instruments, entertaining the crowds while they’re waiting. One of them beats a dhol drum rhythmically, another plays beautifully decorated bagpipes. There’s a man holding a long stick, who stands together with two others. “They’re senior wrestlers, whose role it is now to judge the game,” explains a man in the crowd. “People have respect for them, given their experience.” The man’s name is Khawaja Azad, and even though it’s his first time at this place — he only just arrived in Dubai from his native Pakistan — he’s a long-time kushti enthusiast. True, kushti is losing popularity. It’s not like the old days anymore, when wrestlers like Azad’s grandfather were famous all over India and Pakistan. But the sport is still practiced, and young men continue to join India and Pakistan’s akharas, gyms where wrestlers live and train together. They still practice according to the sport’s age-old philosophies (its origins date back to the Moghul area, when it was developed through a synthesis of Iranian and Indian martial sports) which include spiritual notions and specific dietary rules. Undefeated masters hold the title Rustum-i-Hind or Rustum-i-Pakistan. Its origins date back to the Moghul area, when it was developed through a synthesis of Iranian and Indian martial sports. Down at Dubai’s kushti field, the temperature has dropped a degree or two. The dusk is starting to fall. The last game of the evening is just starting: two new men enter khala, with brightly coloured pants and their gazes fixed at each other. They grab handfuls of sand and rub it onto their skin, sweaty from the heat and the humidity. “It’s for them to get a better grip,” says Azad. “The sand, which is mixed with ghee or oil, prevents them from slipping.” The last game is over quickly — all of a sudden, one of them flips the other over on his back. “Mashallah, mashallah! Very good that one!” shouts Azad with a smile. The crowds begin to disperse. Some gather around the wrestlers, who share their comments on tonight’s wins and losses, others make their way back to the city streets. The drumming and cheering quiets; the air is instead filled with the voice of the muezzin at the nearby mosque. It’s wrestling break — until next Friday.